Commercial ladders provide safe, quick, and efficient access to materials stored in high locations. Easy Rack provides both used and new commercial ladders to industrial, warehousing, and shipping industry clients throughout the Continental United States. Because our customer base is so wide and diverse, we carry a number of very specific designs, sizes, and weight capacities to accommodate the many different work environments where workers need safe and reliable commercial ladders. Warehouses often must convert their unused vertical cube into storage space with a variety of shelving and racking systems. Workers who retrieve materials from these high places need commercial ladders that prevent slippage and falling. They also need commercial ladders that they can move quickly from aisle to aisle, preferably without having to call for assistance or ask other workers to stop what they are doing to help. Steel rolling warehouse ladders offer all of these benefits with a design that allows for both mobility and fixed anchoring when needed. 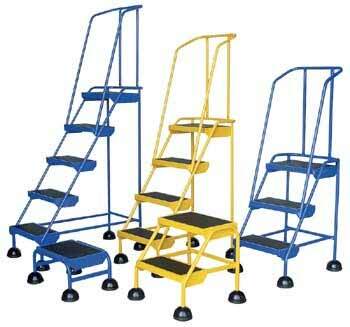 Each of these commercial ladders includes a lockable safety gate that prevents access from unauthorized persons. The gate links directly to casters that either anchor the ladder to the floor or rise up to enable mobility. Each ladder is rated at 350 lbs. capacity. The standard climb angle is 58? (contact factory for pricing on optional 50? Easy-Climb angle). The handrail height is 30" from the steps and 34" around the top platform that includes a 4" toe board. Each step is 24" wide by 7" deep. Easy Rack also carries commercial ladders designed specifically for the safety of workers in shipping and receiving areas. With Walk-Thru Dock Ladders, workers can safely pass beneath ladders without tripping or colliding with other workers or equipment. Walk-Thru Ladders mount directly to the dock face and project outward 8 ?? to provide plenty of walk space. Each unit also features an extra high handrail for balance and grip. Easy Rack carries commercial ladders that add safety and quick access to shelving for workers who carry large, imbalanced loads in their hands or over their shoulders. It is easier for workers to keep their balance when descending alternating tread stairs than it is on traditional stepladders. Alternating tread stairs offer a step for each individual foot, giving the worker a more solid point of grounding and balance. Alternating tread stairs feature handrails on each side of the unit for additional grip and balance. A dual safety chain at the top of the stair prevents accidental falls. Each step offers superb traction with steel, raised surface design. Available in safety yellow finish, alternating tread stairs ship knockdown to lower freight costs for companies on a budget. In many situations, workers have to climb over pipes, electrical conduits, or other obstructions. A multitude of safety hazards can result from using stepladders or rolling ladders in these areas. Standard commercial ladders can easily slip or become imbalanced on uneven surfaces. Workers can also trip over conduit and pipes while attempting to ascend and descend traditional ladders. Crossover commercial ladders solve this problem and eliminate these hazards by creating a bridge that arches over hazardous areas and gives workers a stable platform on which to stand. Easy Rack?s cross over ladders offer permanent mounting, removable two-sided handrails for the upper platform, and toe-boards to prevent material roll offs. Serrated steps for extra grip and safety measure 24" wide and 7" deep with a step height of 10". Total weight capacity is 500 lbs. These highly specialized commercial ladders Meets OSHA and ANSI A14.7 standards and prove ideal for construction projects in equipment rooms and underground areas. To find specific industrial ladder dimensions and product details call one of our expert material handling equipment representatives at 1-888-776-3720 today to place and order.